Rare La Costa Luxury Home: 7342 Corte Tomillo in La Costa Oaks. Carlsbad real estate agents are buzzing about this spectacular luxury home sitting high in the hills. 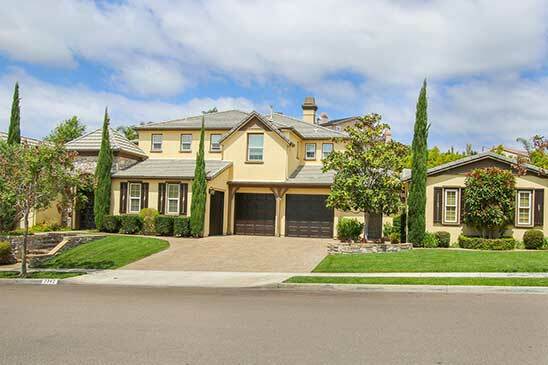 It’s a true rarity among San Diego homes for sale! You see, this La Costa luxury home is sited, built and designed for entertaining on both a cozy intimate or very grand scale. Sitting on what is likely the largest lot in La Costa Oaks, this highly customized La Costa luxury home built by Pulte offers 5 bedrooms, 5.5 baths and a beautifully appointed casita just behind the gated entry and next to fountained courtyard. The main home’s beautiful entry leads in one direction to bright formal living and dining rooms with custom window coverings and a wonderful great room with grand fireplace, huge window overlooking pool, gardens and very private outdoor living area. Head in the other direction off the main hall and you are greeted by a grand stairway to one side and a wood-lined office or library at the other. work, the seating areas, the pool, spa and fountains are all magnificent–but the large attached cabana is truly a masterpiece. There are two built-in barbecues, a full-size refrigerator. large bar, large television behind wood sliding screens and room to entertain a couple dozen friends under the beautiful wood ceiling. Oh, and did we mention the 5-car garage for the auto collector? And what about the location of this newer La Costa luxury home? Many would say it is in the premier area of La Costa, served by Encinitas primary schools, Diegueno Middle School and the highly-regarded San Dieguito High School District. This La Costa Oaks neighborhood is also close to the new La Costa Town Center, La Costa Canyon High School, community swimming pool, exercise facility and club house. Neighboring parks sponsor outdoor concerts in the summer, occasional farmer’s markets, and loads of activities classes for both kids and adults. Local beaches are about 5 miles away. And did we mention La Costa’s weather? Many claim that La Costa’s weather is probably the finest in the country, if not the world. Temperatures are pretty balmy year round and La Costa neighborhoods are just distant enough to avoid most of the coastal fog and accompanying dampness. Skies are generally blue and gardens grow year round. Neither words nor photos nor virtual tours do justice for this near-5000 square foot home at 7342 Corte Tomillo, though.The link above, though, will give you an idea of what this singular home has sto offer. For additional information or to arrange for a private showing, call Roberta or Scott Murphy at either 877-818-8197 or 760-613-6190. Alternatively you may email roberta@sandiegopreviews.com–or have your agent reach out to us.